I’ve been to lots of tastings, and though none of them have involved DRC’s La Tache, I’ve tried some pretty good wines. For that matter, I’ve eaten some great food at wonderful restaurants, seen great art in world-famous galleries, and gazed at wonderful views from the tops of awesomely picturesque mountains. I’ve never seen anyone weeping at any of them. Watching your team lose, or indeed win, an important football match; reading One Day; watching ET. These things make people cry. Sipping some tasty Chablis, not so much. There are plenty of women involved in wine, but I’d say that most people at tastings in the UK are men. British men, taught not to weep in public under any circumstances, not if people call them a very nasty name, or they get stung by a wasp, or they witness their grandmother getting run over by a herd of cattle. I just can’t see a slurp of wine overcoming a lifetime of culturally enforced emotional suppression, however good it is. If I did see a man weep after being stung by a wasp, I would understand. Wasp stings hurt. If I saw a man weep after trying a sip of wine, I would strongly suspect that they were seriously troubled. At the very least, I would think they need to reassess their priorities. I would certainly make sure that I spent the rest of the tasting on the other side of the room. Frankly, the only drink that I could imagine moving me to tears is bleach. Am I wrong? Has my cold, uncaring heart turned totally to stone? Have you ever seen someone blub over wine? Or could it be that the people Victoria Moore writes about had not, in fact, just been given some wine, but had been shown a price list? 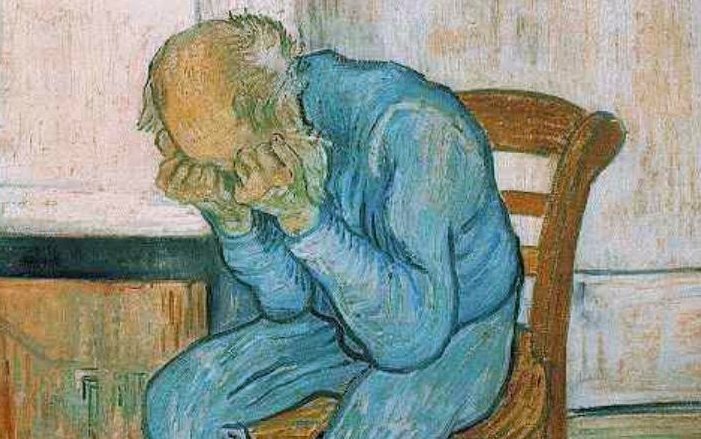 PS The picture is Old Man in Sorrow (On the Threshold of Eternity) by Vincent Van Gogh, or some of it at least.